This description is a "from beach to summit" trip. One should descend to the Spiaggia Grande, the main beach in Positano, and start the ascent from there. 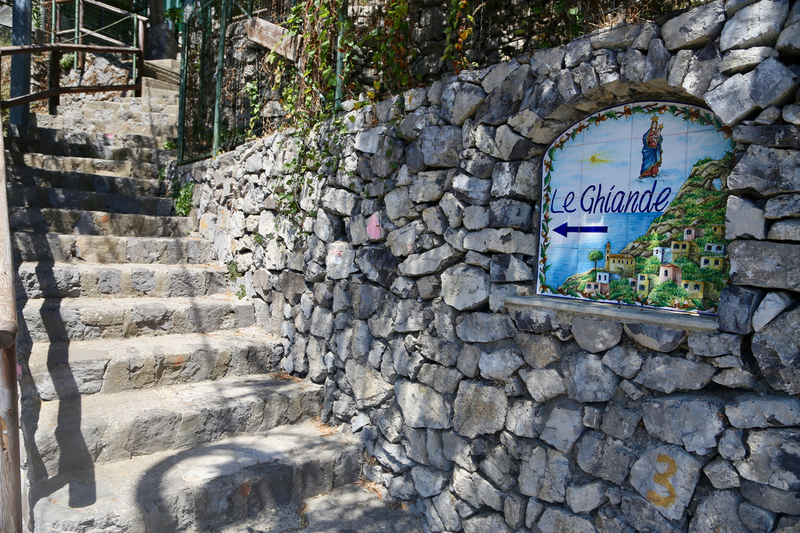 Walk inland towards the church and continue uphill along the only natural and narrow street. You will intersect the first major road, Via Pasitea. Continue uphill from location N40.62927, E014.48734, then intersect the main Hwy. (two-way street) and continue uphill on a smaller road, from this at location N40.63037, E014.48743. At location N40.63094, E014.48759, you should again pick the uphill option. This is a city walk-way with broad steps. There are zig-zags, but generally you move right. Cross a small street and continue on a nice pedestrian path that now traverses a small (upper) city section, arriving at a small square take the path that goes uphill (between buildings) on the far side. This wlll get you to a road that makes a U-shaped curve into and then out of a big gully. Follow around, then arrive at location N40.63326, E014.49481. Leave the road here, steeply uphill on stone steps. You should now be roughly at 380 meter of elevation. After only a few steps, you will arrive at this point, where again you should head uphill in the direction that the the sign encourages. From here, just follow the main trail, typically broad and with nicely made steps, but gradually getting somewhat more narrow. The next thing to look out for is a building with picnic tables. The trail actually forks just before you arrive at this building. Go right, very shortly there is a second trail fork, here you keep left. The trail now climbs along a ridgeline before heading more left. 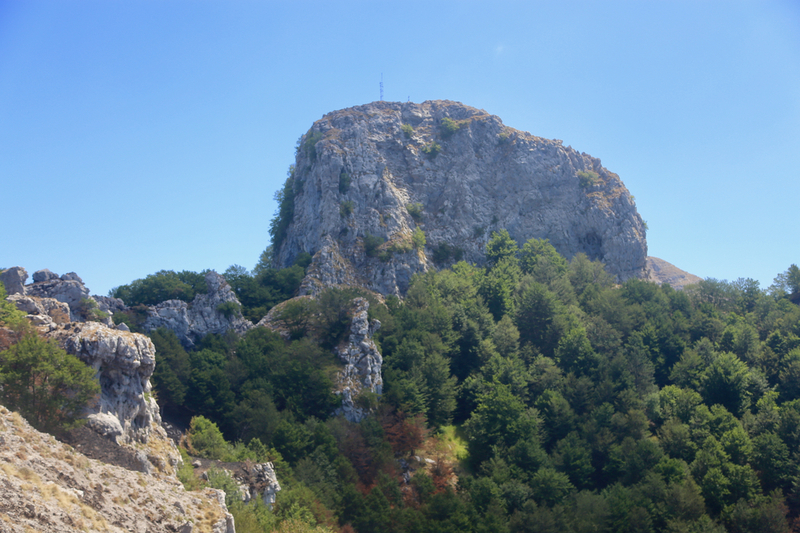 You will approach a cliff formation that serves very well as a viewpoint. Take a picture of Positano from here. The summit cliffs are still quite a bit higher. Immediately before this viewpoint, the trail forks and you should take the right fork (steps) that turns more uphill. Follow the trail until you, when turning a small corner, arrive at a new trail fork, where the right fork climbs steeply with wooden Take this fork. The trail now climbs uphill and eventually gains the main crest. Keep right and follow a clear trail as it traverses just below a local top, then arrives at some old antennas. You will now appreciate why this mountain is also known as Monte Molare. 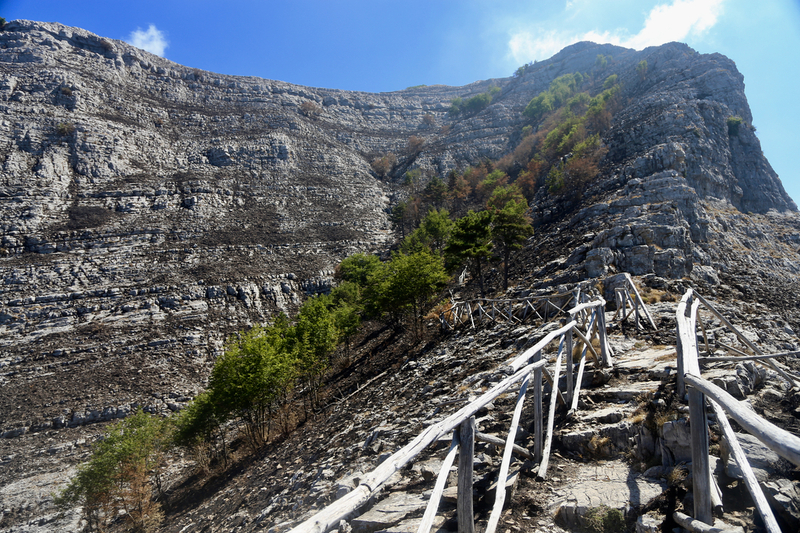 Continue straight and follow the trail that first gets close to the final, steep cliffs, then contours around (righT). You will find easier terrain and the trail completes by a few zig-zags arriving in the shallow saddle between the two competing summit points. Turn right, I assume that this is slightly higher. There is a concrete pillar marking the summit. Make sure to also visit the other high point, it is not marked, but fairly obvious. Monte D'Avella, as seen from the populated land below.